We often talk about “living in the present or living in the now”. But what do we really mean by “living in the present moment”? Does that mean that we do not think about the past or the future? But how can we not think about the past or the future? That would not be possible or desirable. For we do need to recollect the past and to plan for the future at times. Our lives have been composed of thousands of meaningless moments all strung together.. we rush blindly through the day fall into bed exhausted and wake up the next morning repeating this vicious cycle.. With some stroke of luck, there may be a sprinkling of sacred moments mixed in. I’m sure you can think of a few sacred moments in you r life – your wedding, the birth of your child or children, a reunion with a long lost friend or relative, meeting your soul mate or perhaps a heart stopping moment of connection in the middle of the natural world surrounding you. These are the moments that fully consume us with joy and awe. .. 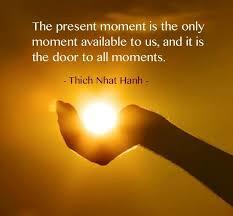 It is during these moments that we are completely present in the moment. We are not thinking about tomorrow or trying to rush through the experience to get to the next. We are fully in the now, and the now is truly amazing. In other words we are taking time to smell the roses. Actually, being in the moment means being mindfully aware of what is going on right here and now, in our experience, and this includes any thinking we do about the past or future. Much of the time our experience does not have this quality of awareness or mindfulness we do not observe our thoughts. A lot of the time we are like robots, automatically living out habitual patterns of self-pity, anger, wish fulfilment, fear, etc. These habitual tendencies take us over and run our lives for us – without our being able to stand back and decide whether this is what we actually want to be doing. It can be a real shock when we start to realize just how habitual and automatic our lives are, and when we realize how much runaway thinking leads to states of suffering. Being in the present means having an open mind seeing things for what they are presenting at that particular moment… not an idea of the person or thing you had in the past or projection of the future.. One of the major characteristic of wisdom is seeing everything with a new eye even though you have encountered the situation or met the person before… Remember change is constant … people change, situations change every minute, second…. When living in the present any lesson from the past becomes relevant and is applied now. Any planning as well as working toward achieving a particular goal is done now. For example, if you made a mistake in the past and learn from it now, you are using clock time. On the other hand, if you dwell on it mentally, and self-criticism, remorse, or guilt come up, then you are making the mistake into “me” and “mine”: you make it part of your sense of self, and it has become psychological time, which is always linked to a false sense of identity. Non-forgiveness necessarily implies a heavy burden of psychological time. If you set yourself a goal and work toward it, you are using clock time. You are aware of where you want to go, but you honour and give your fullest attention to the step that you are taking at this moment. If you then become excessively focused on the goal, perhaps because you are seeking happiness, fulfilment, or a more complete sense of self in it, the Now is no longer honoured. It becomes reduced to a mere stepping stone to the future, with no intrinsic value. Clock time then turns into psychological time. Your life’s journey is no longer an adventure, just an obsessive need to arrive, to attain, to “make it.” You no longer see or smell the flowers by the wayside.